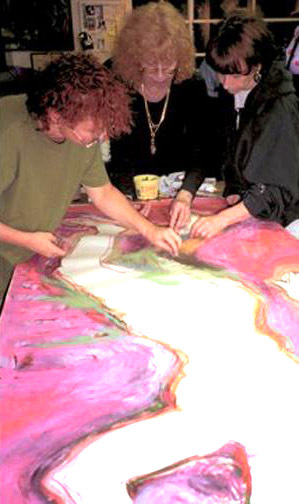 Group Nine has developed a unique collaborative process resulting in art unlike any done by its individual members. The idea of forming a collaborative group evolved out of the energetic exchange of ideas that happened when we met as a group of friends for regular, unstructured discussions at each other's studios. Our experience of working in collaboration relies on maintaining an atmosphere of unconditional trust. Given this bond, we are free to engage in a lively synergy of spontaneity and negotiation and a relinquishing of ego and ownership. Our art-making always moves forward through a process of non-hierarchical improvisation. The demeanor of the group while in discussion or at work on a piece is animated and playful with an underlying attitude of give and take. No one is in charge. Once we establish guidelines at the outset of each project, we move through a process of negotiation and consensus building. Ideas and discussion flow. Eventually, we commit to a concept and discuss format and medium. Format is limited to surfaces that can accommodate nine of us, fit in the studio being used, and be physically stored. The art materials we use have included such media as collage, charcoal sticks, conte crayon, oil pastel, crayon, and graphite pencils; oil paint, acrylic paint, gesso and Rhoplex. Each new project spawns a working process particular to the variables of studio site, surface, medium and concept. For example, in “Shifting Positions,” each member took a turn assumimg a position on a six foot length of paper on a table while the other members then drew her outline with marking pens. Later, the outlined poses were pinned to the wall and worked on over a period of several months. In the work “Circle,” we chose circular elements as our compositional starting point, we stood before a seventeen-foot length of drawing paper and rotated positions every nine minutes over a period of multiple working sessions. When unanimous agreement was reached, the work was considered finished. The collaborative experience has a positive influence on each of us. 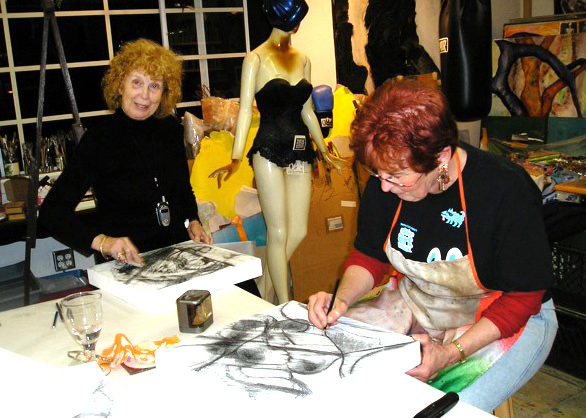 The heightened energy and freedom that comes when we give up control in our collaborative art-making mode, allows friendships that support us in our independent work and significantly touch our private lives. Collaboration and communiry have played a significant role in feminist art practice since its beginnings. 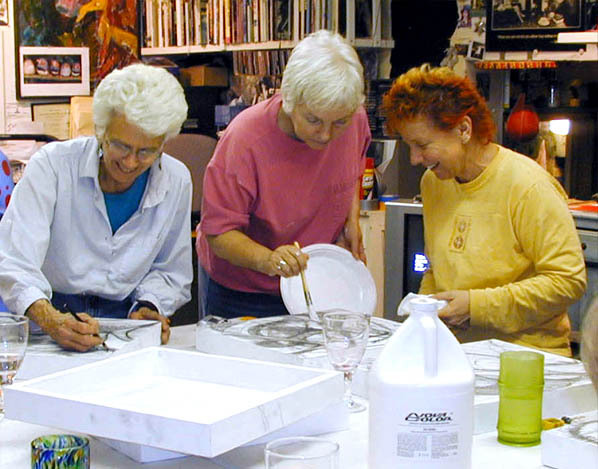 An outstanding example is Group Nine, nine women artists who have literally painted together for more than 20 years. Many are SCWCA members and all are CSUN alums. 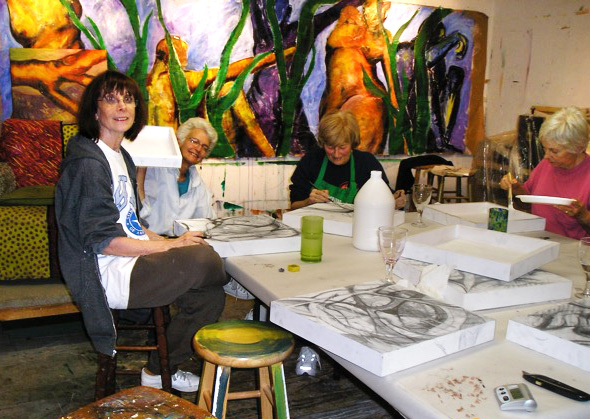 Last fall, I joined six of the original nine artists in Lynn Bassler's Northridge studio for a session of "organized chaos." Their postmodern model for art challenges notions of authorship as well as the idea of a single artist in private workspace. 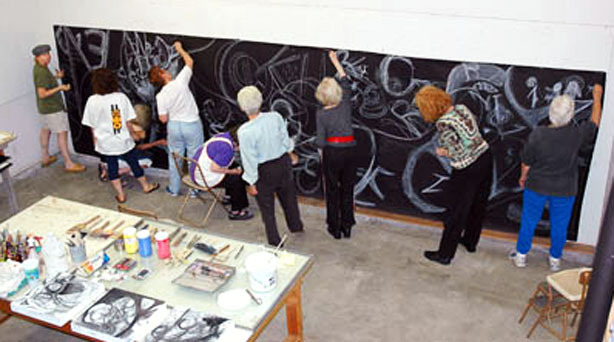 They set a timer and each artist works a designated section of a large canvas. One artist uses bold brushstrokes, another delicate, while another has a completely different mode of marking the canvas. United through color and form, the resultant imagery speaks of the finest post-painterly abstraction. These women find this mode a liberating practice in comparison to solitary work in which each is still involved. I say, "hail the work and example of these amazing women.
" 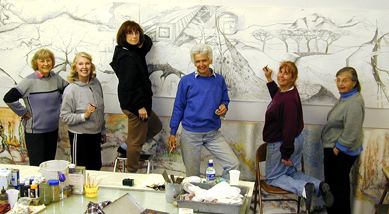 Group Nine artists include Patti Akesson, Lynn Bassler, Merrilyn Duzy, Myra Gantman, Dona Geib (d.2013), Midge Lynn, Barbara Nathanson, Anita Segalman (d.2016) , and Norma Jean Squires (d.2015). This group plans to continue their collaboration until there is just one. The collaborative working methods evolved by the women of Group Nine raise two fundamental issues regarding the work of art: they question the notion of authorship and, by so doing, challenge viewer expectations about how to approach an art work. Their reliance on consensus for decision-making and their emphasis on process over product present an alternative model of artistic practice based on collective social structure. The popular view of the visual artist is of someone sequestered in a private space working to establish a distinctive visual identity, with recognizable characteristics and signature style - subject matter, materials, visible aesthetic decisions, and so on - that establish a personal authenticity. And, indeed, each of the artists of Group Nine - Patti Akesson, Lynn Bassler, Merrilyn Duzy, Myra Gantman, Dona Geib, Midge Lynn, Barbara Nathanson, Anita Segalman, and Norma Jean Squires - maintains such an artistic practice. There is no apparent commonality in their work, which ranges from printmaking and sculpture to painting and computer-based imagery, and from figurative and landscape works to total abstraction. But there is different common thread that links these artists. All alumnae of Cal State Northridge - albeit at different times - they knew and admired each other's work and wanted to remain in contact. To do this, they began to meet informally but regularly in the late nineties to discuss issues of concern to them as working artists. From these discussions evolved the idea of experimenting on collaborative artwork. Some simple ground rules were established: no restrictions on size or format except those imposed by the physical space; only the simplest of materials (e.g., charcoal, gessoed paper, collage and other mixed media). Among the approaches they took is one where the paper is divided into nine sections and everyone rotated from one section to another at timed intervals, echoing the early surrealist cadavre exquis drawings. Unlike those simple experiments in automatism, however, each person continued working on a section previously worked on by someone else, frequently during the boundaries between sections to make for a more even flow of imagery. This required what was most difficult part of the process - the abandonment of "ownership" of any mark or passage. It soon became clear that negotiation and consensus-building were paramount. The artists included this as part of the process, pausing to give informal critiques before moving on. While the immediate loss of control was frustrating, many also found it liberating, engendering a sense of freedom and playfulness. Paradoxically, Group Nine's process recalls - and then subverts - two other historical antecedents: action painting and connoisseurship. The former assumed that each gesture by a painter was capable of conveying a state of mind and cluster of emotions. The latter was predicated on the presumption that a trained eye could discern the authorship of unsigned work through a hierarchy of distinguishing markers. It is with these presumptions that many viewers have learned to look at art. While the works produced by Group Nine may indeed convey states of mind and emotional moods, they are the result of nine, frequently indistinguishable hands, not one. The artists themselves acknowledge that when they are done they cannot always recognize their own marks. One participant likens the experience to going from being a soloist to being a member of a chorus. To pursue the analogy, they are more like an improvisatory jam session, where, within a simple framework, players are free to compose at will while always mindful of the other players. The past several decades have seen the rise of numerous collaborative endeavors - Helen and Newton Harrison, Gilbert and George, Komar and Melamid (now with elephants). Christo and Jeanne-Claude. Most often there are two people, frequently couples, working in tandem or with clear-cut divisions of labor. Others have subsumed their personal identities in favor of aesthetic or political agendas, like Art & Language or Group Material. In the casa of Group Nine, both the methodology and the result differ from these earlier examples. And in the absence of any hierarchical markers, the viewer must relinquish customary critical criteria and submit to the same requirements as the artists, thus becoming participants in an extended collective process.